When its time to go out and enjoy the outdoors, sunny days at the beach and summer nights, we can't forget our skin the extra protection it requires during the hot months needs to be a staple in the daily beauty routine of everyone. Going beyond powder, we also have excellent liquid makeup available too: Liquid foundations with soft texture and light covering action that are great for summer time as the fluid textures gently enhance the skin rather than mask it. This fluid makeup moisturizes the skin and protects it since most of them incorporate a SPF, and they give us a nice tone of golden or tan-depending on the skin's own tone and the final image that each consumer wants to get, yet without clogging the pores. Droppers allow the consumer to define the level of coverage that they want since the final result depends upon on the number of drops of applied, providing an alternative to solar radiation for the summer - healthy for the skin and and perfect for a luminous look, with natural, moisturized, homogeneous dermis perfectly coloured for simply fantastic skin. 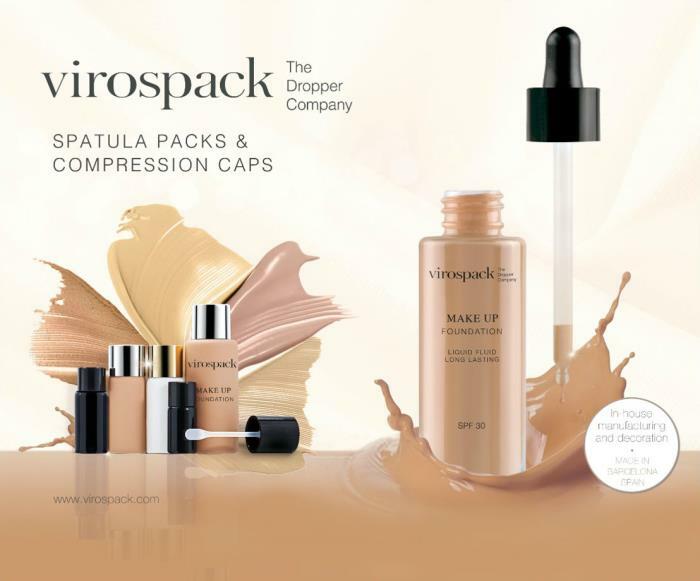 Virospack's droppers incorporate a drainer for the pipettes to prevent the container from staining during use, ensuring greater comfort for the consumer through the reassurance that product will not be lost or wasted. In addition to droppers, Virospack's wide range of standard options also includes moulded and tubular bottles. The tubular range is available in capacities from 2ml up to 35ml fulfilling the demand for small sizes for promotional formats and testers. These packs can also be offered with spatulas for easy testing of liquid foundation. The spatula packs, like all of Virospack's products, are manufactured and decorated at its facilities in order to offer the best solution to each of the company's customers and a unique solution for each brand.